This is the view from my little blue house. Everything inside has a slightly blue cast. During the day, you can crack open the door and let more naturally coloured light into the space. It reminds me a bit of the Wizard of Oz when Dorothy and company drew back the curtains on the wizard. I do sometimes get cold but it’s usually a situation that can be addressed through exercise, eating, or adding clothing layers. Cold doesn’t often make me want to stop. Here on this climb, what makes me want to stop, is the long dark nights. Because of the cold, (funny given what I just said above), we head to our sleeping bags about 8 pm for a 12 night. I put on a podcast to listen to and fall asleep rather quickly. You may have heard the quote, “It’s darkest before the dawn” and that is true here for me these past nights. About 4 am, I wake to wrestle with doubts, fears, and other dragons of the mind/icefall. It is then that I am most homesick missing family and friends. It is then that I doubt whether I am tough enough to persevere and pull almost every foot step from the deepest part of my being. It is then that I fear getting hurt or killed and leaving a mess for dear folks to clean up. I am not alone in these hard nights (well except that I am alone in my tent). 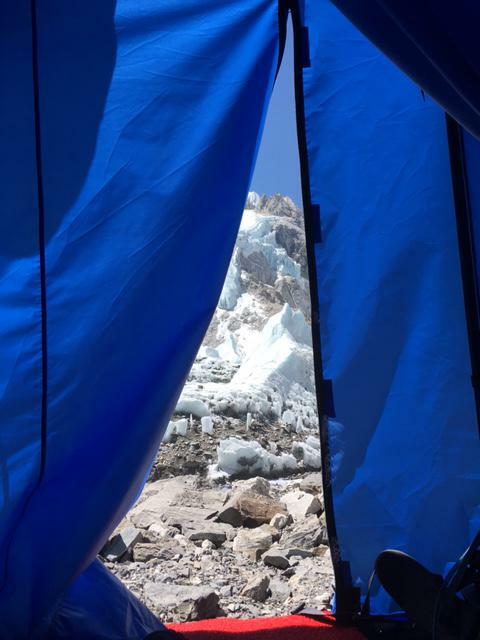 Ask most high altitude climbers in the right moment and they will also pull back the same kind of curtain. They will tell stories of restless nights where the sirens of lower altitude call to them almost incessantly to descend, to leave, to turn your back on the mountain. Pema Chodron, the North American Buddhist teacher, wrote a book called, “The Wisdom of No Escape” where she takes about the value of taking away our escapes, our traditional coping mechanisms, our usual responses by running towards the biting dog instead of away. Some expeditions naturally have no escape due to remoteness or cost of evacuation. Everest is rife with escape. Given the multitude of helicopters flying to base camp these days, one could decide on escape and be back in Kathmandu the same day. Those sirens of escape live in the icy shards of the icefall that slides downhill each day as well. It’s a job not to jump aboard and chose comfort over discomfort, couch over struggle, loved ones over isolation. You all inspire me. The students and teachers who are following the expedition inspire me. The challenge inspires me. Wanting to be and do my best inspires me. Trying to find the sweet spot between over reaching and boredom inspires me. Commitments I’ve made to myself and to others inspire me. Knowing everything including high mountain summits and dark deep night pits are impermanent inspires me. And really, bottom line, I’m making this all up…I’m hanging in, I’m wanting to quit, I’m wanting to climb high, and I’m wanting to come home safe and sound…and in the interstitial spaces between night and day, I ponder it all and so wanted to share what was behind the curtains/tent doors. Food is packed, gear and clothing are selected and stuffed into small bags, and it’s time to close this update for now…have some lunch, tidy my little blue house, and try to get some sleep before our 1 am wake-up for a 2:30 am start. I will make an audio call when we reach Camp One and are safely through the icefall so we can all let out a collective sigh of relief. Thanks for all the notes, comments, and texts of encouragement…they help more than you can know. “It is then that I fear getting hurt or killed and leaving a mess for dear folks to clean up.” This statement created such emotion for me. It is the raw real truth and you are so brave to share it all. You are an exceptional human being and I truly look so forward to your posts. Safe Crossing of the Ice Fall – You Got This! Maria – Is there any animal life at all on the mountain? Thanks for all the effort you put into posting. It means so much to me, and I know- to others – to be able to follow you, as you do, what we only dream of doing. Keep going, but safely. I love your phrase “pull almost every foot step from the deepest part of my being” because to me (an Everest wannabe), I guess this is what you need to climb Everest? Your “writer’s voice” reaches out across the maze of age, experience and habitat; I so enjoy.